Autumn brings an end to warmer and longer days but it does add great colour to our trees and plates. Squash plants and in particular pumpkins are in prime condition at this time of year. I’m definitely trying to make the most of them and adding them to lots of different dishes. A simple spoonful of pesto brings lots of flavour to any recipe and I love to experiment with different combinations. Pesto is traditionally made using pine nuts but they can be quite expensive and hard to find in shops. Hence I use nuts or seeds in my recipes. Roasting pumpkin seeds until they begin to pop make a great base for pesto. So reserve your seeds when you are carving your pumpkin to make this very tasty pesto. This pumpkin recipe is great as a side with roast or grilled chicken or added to any salad. Find out more great pumpkin and squash recipes here. Halve the pumpkin, scoop out the seeds, set the seeds aside and slice the pumpkin into half moon shaped wedges. Stir the honey, oil, salt and pepper together in the bottom of a roasting tray before adding the pumpkin. Wash the seeds in a fine sieve, place in a dry frying pan over a low heat until they begin to pop. Place all the pesto ingredients excluding the olive oil in a food processor/blender or pestle and mortar. Combine until a smooth texture is formed, gradually adding the olive oil. Place the pesto in a sterilised glass jar with another layer of olive oil on top. Store in the fridge for 3 weeks. 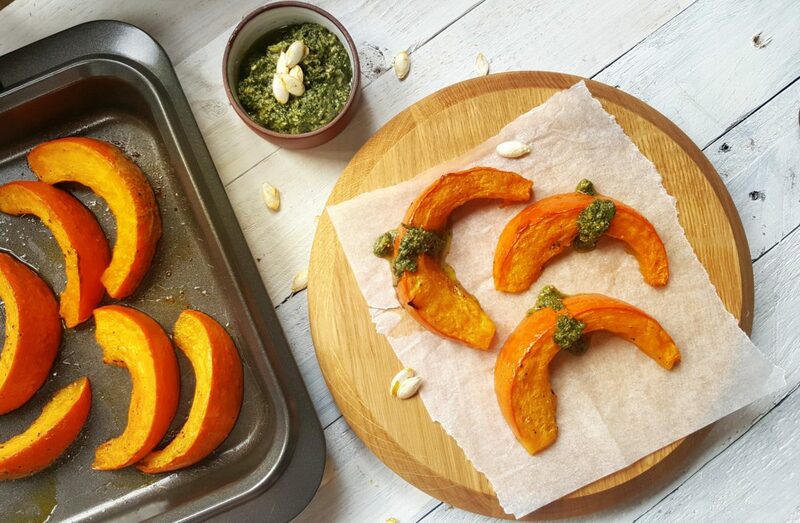 To serve: drizzle the pesto over the pumpkin wedges.